When wealthy Lord Rule offers for the hand of the eldest Winwood sister, she knows she must accept, even if she loves another man. Her brother has sunk the family into debt and the only way of extricating them is for one of the sisters to marry a rich man, and Elizabeth is by far the prettiest. However, the youngest sister, 17 year old Horatia, is determined that her sister shall marry her beloved Edward, and so goes to Lord Rule to explain and offers herself in her sister’s place. To the family’s surprise, he accepts. It appears to Horatia that Rule does not love her (he has a mistress), and that bothers her, especially as she begins to fall in love with him. This leads to several misadventures, especially when Horatia becomes determined to conquer the heart of Lord Lethbridge, an old enemy of Rule’s, and thus make her husband jealous. The plan misfires and Horatia finds herself in deep trouble. Lord Rule, however, has an ace up his sleeve. 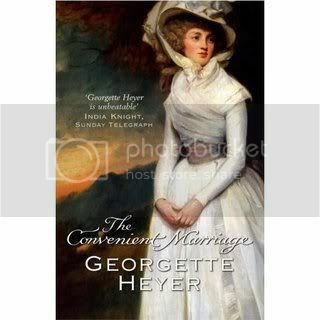 Most of Georgette Heyer’s historical romantic novels are Regencies, i.e. they take place during the years 1811 to 1820. It is therefore refreshing to find one that takes place in the 18th century (more precisely in 1776), when fashions were - to our modern eyes - rather silly: wigs, hair powder, towering hairdos, panniers, beauty spots, etc. Those fashions play a part in the story. Heyer’s attention to detail is amazing and she describes clothing styles, hairdos and accessories with gentle mockery of both fashion and wearers. The cant and slang expressions are probably genuine, considering how thoroughly she researched all her books. The story is deliciously frothy and silly - not that there is anything silly about the plotting, but the story is a farce that hinges on characters being silly. Rating: Another delightful confection from Georgette Heyer. 3+ stars.